Dorset Hall is a Grade II listed building of “Georgian” character. Despite later alterations and extensions it remains an important link with Merton’s rural past. Edwart Hubbart Senior, a yeoman farmer in Merton and Wimbledon. From 1906 the property was home to Rose Lamartine Yates, Organising Secretary and Treasurer of the Wimbledon Woman’s Social and Political Union. The property and its fine garden hosted campaign and fundraising meetings for the women's suffrage movement. Dorset Hall was also a welcome refuge for suffragettes recovering after prison terms and hunger strikes. 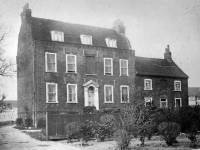 Rose bequeathed the house to Merton and Morden Urban District Council in 1935. The property is now divided into flats.